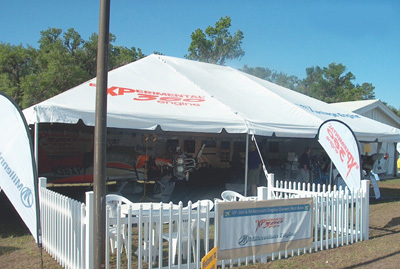 This extra-large sized frame tent covers a 30 by 30 foot area with a strong vinyl top available in a variety of solid or striped patterns. The frame is constructed of aluminum and steel components, and numerous added features such as reinforced corners, rust-resistant buckles, and double-reinforced rope make this tent more durable and dependable than comparable models. A one year manufacturer's warranty guarantees construction quality. Included in the box are an instruction manual, a carrying bag, and a patch kit in case of damage.